Here is a gif of one cute idiot panda trying to wrestle a much bigger and angrier panda unsuccessfully. What a dolt. This is a short clip showcasing what a dumb idiot this dolphin is. How can this dolphin not even understand that going straight up is an idea only fit for an ignoramus. Stupid. This is a dumb child jumping in puddles, only to have the puddles exact their revenge. What an idiot. I have spent the last few days back at my parents' place in Valley Springs and over the course of these last few days I have come to realize that one word has described my life above all others. 1. My parents helped me out with car repairs. 2. My parents and grandparents bought me meals, coffee, assorted consumable items. 3. My parents bought me clothes. 4. My grandparents offered to help me finance college (again). 5. My grandparents gave me sobering, helpful advice for my future. 6. My parents gave me free reign of the house that I have been moved out of for over a year. And that's an incomplete list. To list out all the things that my family and others have done for me both during this week and over the course of my life would be way longer than anyone would have the stamina to read. So I realized, I have a major responsibility. In life, I have been extraordinarily blessed and entrusted with much more resources than the average person of my age is given. I realized that my life is one that would be incomplete and unfulfilled if I did not accomplish something worthy of the gifts that have been given to me. I've come to see also that beyond what my family has given me, God has given me more. God gave me that family, this country of birth, and the natural gifts that I use everyday to push myself forward. I have to take these gifts to their limit. I owe it to God, family, church, and country. This calling that my background saddles me with is beyond a continuation of where my family's goals have been, or the goals of my peers, or of my religious communities. I have a spirit of ambition growing inside of me. I don't know to what end it is pulling me, but I know that I have to give back. "I am, among all men, most richly, blessed." About a week ago, Dave's and my coworker Gabriella invited all of the naturalists to her family's house for the weekend. It sounded like a delightful idea. During the planning of this event, Gabriella approached Dave with a sinister idea. She says to him, "Yo Dave, it'd be really funny if you showed up at my parents' house dressed as a Mormon and tried to talk to them about Mormon stuff." Having done this, it was now time to talk the world by storm. A Mormony storm. On the way to Gabriella's house we started to get our story straight. Dave and I imagined new lives for ourselves, from attending BYU to plotting out how we would approach the house without being seen. But, soon there was a hiccup in our plan. We sent a text to Gobby to ask her when she and the people in her car would arrive at her parents' house. We realized that we were on track to get to her parents' house twenty minutes before she would. And despite our intention to make everyone around us uncomfortable, we decided to wait for Gobby to show up for our own sake. 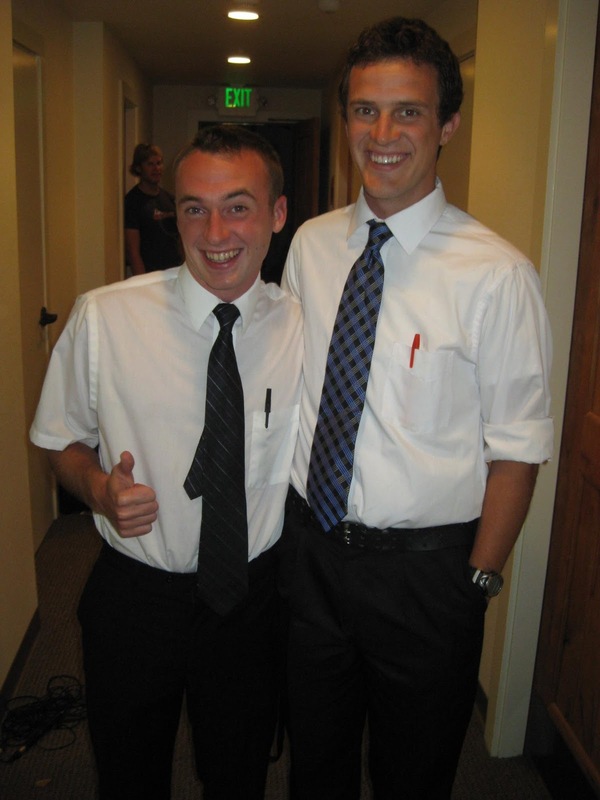 So, we decided to do what all Mormon missionaries do on their down-time. Get coffee. So Dave and I camped out at Starbucks in our LDS uniforms and watched people's reactions to us. It was then that Dave and I began to realize just how much people assume about someone by the way that they dress. Even though it was our intention to channel a stereotype in our clothing, it was still surprising to see the looks that we received from others. Everyone around us thought they knew everything about us just by looking at us. Soon it was time to make our move on Gobby's parents. I was nervous as we walked up to the door and we rang the doorbell. Our goal was to get invited to dinner as Mormons. We knew it would be difficult. Dave: Hey, how's it going? Do you have a few minutes to talk? Gobby's Mom: Actually, we were just sitting down for dinner, sorry. Dave: Well... so do you have a few minutes? Gobby's Mom: No, but we believe in Jesus, we believe that he died and rose again and is in heaven now, and we're going to heaven when we die. Gobby's Mom: Have a good night! And that was the end of the conversation. Less than thirty seconds, from beginning to end. Dave and I were cracking up on the way back to the car. We realized that we hadn't even said anything about God, religion, the Book of Mormon, or anything. We just wore ties and tennis shoes and showed up. We wanted to change our clothes so we pulled into the next street over. On one side of the street there was a fence that would allow us to change our clothes without being right in front of someone's house, so we parked there and got into our normal clothes. We noticed a guy on a bike across the street watching us. We drove back to Gobby's house and opened our doors to get out of the car. All of a sudden, out of nowhere, the guy on the bike shows up and says, "What the f--- are you guys doing?" We were taken aback by this a little. "Um, we were just pranking our friends down the street here." Dave continued, "Why do you ask?" "You guys were just being really suspicious outside my house." "Nope, we were just playing a prank on our friend." Then he rode off on his bike. Dave and I shrugged our shoulders, locked the car, and went back to Gobby's front door. Dave and I were standing in the exact same place that we were when we came dressed as Mormons. We rang the doorbell, and Gobby's mom came to the door again. She invited us in without even mentioning that we had just shown up as Mormons less than five minutes previously. I thought this was odd. A few of the naturalists were already sitting down at the table. One of them said, "We thought you'd show up all dressed up." That's when Dave and I realized not only that Gobby's mom hadn't told them that Mormons had shown up at the door, but she didn't recognize us as those Mormons. At all. We all laughed, Dave and I especially. It was a pretty funny night, and I learned a lot about people. I decided that in the future I will be a lot nicer to people who show up at my door. It's a difficult thing to just show up and talk to a total stranger about God on their own turf, even as a joke. And, people aren't always what they appear. And furthermore, judging someone by the way they dress without taking note of the person underneath is a surefire way to moderately embarrass yourself. Appearances can be deceiving. Jeff and I met the Coffis brothers yesterday. During the events of Jeff's and my wanderings around Pacific Avenue yesterday, we met a couple of guys playing music on the sidewalk. They were the Coffis brothers, and they were pretty darn amazing. I bought their CD, and finally gave it a listen all the way the through today. All of it is good, but there was one song in particular stood out to me. The song was called 'Round Here on their self-titled album. Look it up on iTunes. It's great. My life is changing. I'm in a new place, doing new things, have new priorities, starting new projects, meeting new people, and realizing new ambitions. I'm going to need a place to chronicle the changes and interesting events that occur in my life over the next 9 months of living in the Santa Cruz area, hence this blog. I am doing this for a couple reasons. I am writing this for me to know where I have come from this year and I am hoping that whoever reads this blog will be inspired to attempt bigger things with their life. One of the things that Jeff (my roommate for the school year) and I have been talking about is our "1,000 Hour Projects" that we are attempting. The idea comes from Malcolm Gladwell's book Outliers which among others things makes the claim that anybody who is really good at something has practiced it for over 10,000 hours. So Jeff and I are toning down this rule to 1,000 hours to see if it's really something that is workable. So while Jeff is doing song-writing for 1,000 hours this year, I'll be making beats for 1,000 hours. Being in the Santa Cruz area also means that we will be meeting a lot of interesting people. Even today, Jeff and I made friends with a blind man with developmental disabilities and met two brothers who were performing music on the sidewalk of Pacific Avenue. Stuff like that will be topics of this blog as well. Besides all this will be my own personal musings on psychology, philosophy, and religion, all of which spend a lot of time in my thoughts. I'll recommend books, websites, and anything else I find interesting. That's all. Stay tuned for more, if you'd like.